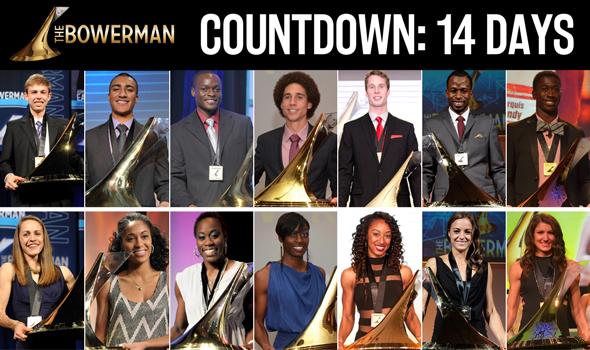 NEW ORLEANS — The Bowerman Award made its debut in 2009 to honor the most outstanding male and female collegiate track & field athletes of the year. Its namesake is Bill Bowerman, the legendary Oregon coach and co-founder of Nike. Jenny Barringer (now Simpson) and Galen Rupp were the first two winners of The Bowerman Award and deservedly so. Barringer set five collegiate records (two indoors, three outdoors) and won two NCAA titles in 2009, while Rupp established an American record and collegiate record in the indoor 5000 and captured five NCAA titles. Since the inaugural ceremony at the Orlando Grande Lakes Resort, which the USTFCCCA Convention returns to this year with expected record attendance, 12 more athletes joined Barringer and Rupp as former recipients. Other male winners include Ashton Eaton (2010), Ngoni Makusha (2011), Cam Levins (2012), Derek Drouin (2013), Deon Lendore (2014) and Marquis Dendy (2015). Past female winners include Queen Harrison (2010), Jessica Beard (2011), Kimberlyn Duncan (2012), Brianna Rollins (2013), Laura Roesler (2014) and Jenna Prandini (2015). When you do the math, it adds up to 14 winners in the history of collegiate track & field’s version of The Heisman Trophy. And what do you know? There are just 14 days left until we hand out the men’s award to Donavan Brazier, Edward Cheserek or Jarrion Lawson and the women’s award to Courtney Okolo, Keturah Orji or Raven Saunders on Friday, December 16. The ceremony starts at 7 p.m. ET at the JW Marriott Orlando Grande Lakes and will be broadcast LIVE exclusively on FloTrack.org.